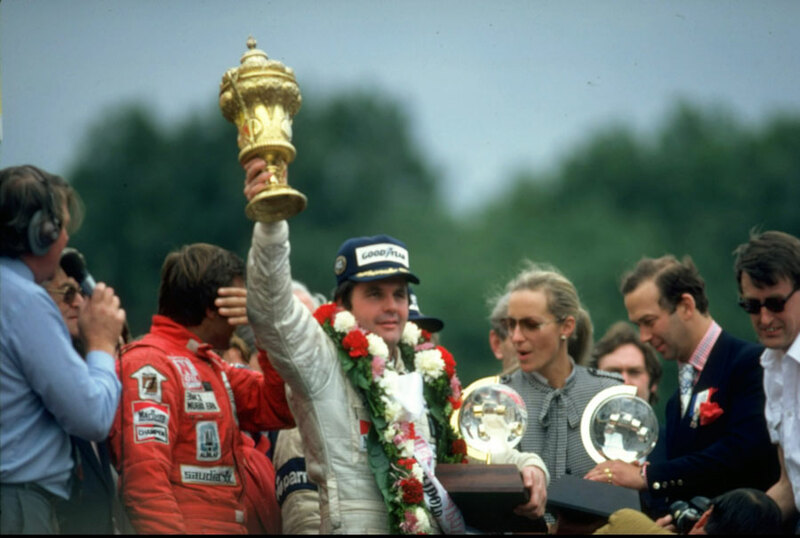 Alan Jones won the British Grand Prix, his third win in succession even though the one in Spain had been invalidated, to extend his lead over Nelson Piquet in the drivers' championship to six points. "This was the one race I wanted to win above all the others," he said. "I consider this my home grand prix." At the start of the day it seemed the 100,000 crowd at Brands Hatch were set to see the Ligiers dominate. They occupied the front row and Didier Pironi eased into an early lead from Jacques Laffite, with Jones, who tried to sneak through, left floundering. "I made a better start than Laffite and drew alongside," he said. "But he moved over and I had to put my right-hand wheels on the grass to avoid him." Within 20 laps Pironi was into the pits for new rubber, and as the day progressed it was clear the team had made the wrong call regarding tyres. Laffite took over but as he passed the pits on the 30th lap he signalled he also needed fresh tyres; he did not make it, as halfway round a deflating tyre sent him spinning into the crash fencing. Pironi, who had recovered to fifth with some bold overtaking, was also eliminated by a puncture on the 64th lap. That allowed Jones, who admitted he thought the Ligiers "would drive off into the distance", to come through to secure the win, although he had to nurse his car home as his own tyres started to disintegrate. Jones had another reason to smile. "I was delighted that they played the Australian national anthem, because when I won in Spain they played the Austrian anthem." Piquet took second for Braham and the second Williams of Carlos Reutemann, the winner 12 months earlier, completed the podium. Almost unnoticed, Derek Daly took his Tyrrell to fourth place, helped by the frailty of other cars.